The Franklin Civil War Round Table (FCWRT) is delighted to announce our future programs will be held at the Carnton Plantation’s Fleming Center beginning with the December 13 2015 event. We are extremely excited to be holding our presentations at Carnton and greatly look forward to this new relationship. Meeting on the actual battlefield will enhance the educational experience we strive to provide to our members on the entire Civil War era. The event is free to the public, however reservations are suggested. 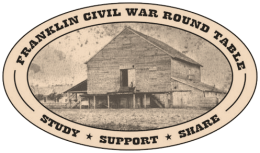 The Franklin Civil War Round Table is an educational program of Franklin’s Charge and meets each month at Carnton Plantation’s Fleming Center, 1345 Eastern Flank Circle. For more information, email fcwrt@yahoo.com, or visit http://www.franklinscharge.com/round-table. This website was funded in part by the Tennessee Civil War National Heritage Area, a partnership unit of the National Park Service.